Manager’s report will include a status report of capital improvements, wastewater treatment plant operations, accidents and claims for the month, and a review of expenditures, revenues, purchases, and abatement orders. Discussion/action on public hearing for second and final reading of Ordinance No. 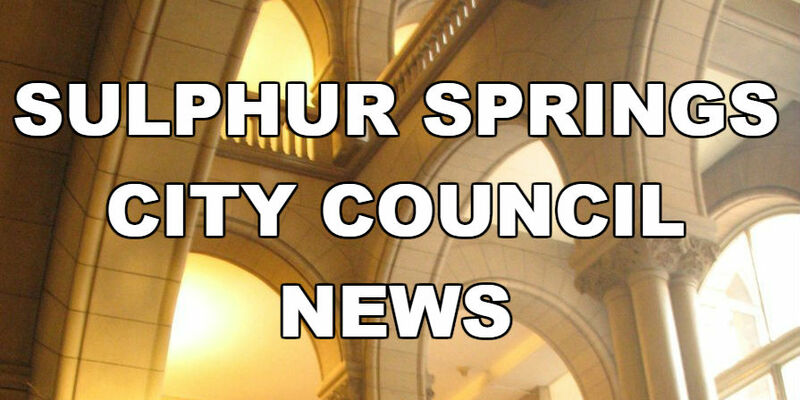 2739, an ordinance of the City of Sulphur Springs, Texas, adopting the recommendations of the 2018 Charter Review Committee, approving proposed amendments to the City of Sulphur Springs, making recommendations for inclusion of proposed changes to the official ballot of the upcoming municipal election, making findings in support thereof, and overruling any ordinance in conflict herewith. Discussion/action on first reading of Ordinance No. 2740 for the annexation of Area 1, Pioneer Business Park and adjacent properties. Discussion/action on first reading of Ordinance No. 2741 for the annexation of Area 2, Heritage Business Park and adjacent properties. Discussion/action on first reading of Ordinance No. 2742, a budget amendment for Ordinance No. 2727, the 2018 – 2019 Annual Budget Ordinance. Discussion on a report regarding traffic stops and arrests. Discussion/action on Resolution No. 1160 amending an existing 380 Agreement for property located at 216 Main Street and authorizing the City Manager to execute the amended 380 Agreement. Discussion/action on Resolution No. 1161 approving a homeland security grant application to the Officer of the Governor and designating the Mayor as the authorized official signatory. Discussion/action on the assignment of Airport Ground Lease for Lot 1220-17. Discussion/action on bids and award of contract for solar LED lighting and poles for the Crosstown Trail project. Discussion/action on Resolution No. 1162 calling for a general election for City Council Places 4 and 5, naming election judges, and setting dates for early voting. Discussion/action on Resolution No. 1163 calling for a special election to complete the term of Place 6. Discussion/action on Resolution No. 1164 calling for a special election to amend the Charter of the City of Sulphur Springs, Texas. Discussion/action on purchase of election equipment. Discussion/action on Resolution No. 1165 expressing support for the proposed renovation of the Trinity Oaks Apartments located at 600 Woodlawn and their application request for housing tax credits, waiving $250 in fees for the project and authorizing Mayor John A. Sellers to sign the resolution. Discussion/action on bids and award of contract for Highway 11 West Lift Station relocation.